Part of simple living is clearing away the objects in your life, most especially in your home, that are quite literally: just taking up space. We need a new house, at least an addition... I need to spend a lot of money on organizing bins to fit all my STUFF better into my closet... etc. ...when in fact you really need to say, "Goodbye." to the things that have outgrown their usefulness... or maybe never fulfilled your expectations to begin with. What to keep? The things that you use daily... even weekly... even seasonally if you do actually use them and need them for a specific purpose. If you host Thanksgiving dinner every year you can’t chuck the turkey platter... just try to think of some other uses for it through out the year. I subscribe to many wonderful minimalist blogs: Loving Simple Living, The EveryDay Minimalist, The Minimalists, Becoming Minimalist to name a few. Their advice, especially having to do with mental clutter, is usually very thought provoking. 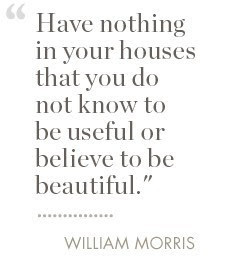 This is were William Morris’s ideas come in... keeping things that you believe to be beautiful has a value too... it is not practical. It is aesthetic. For me Simple Living is about focusing on the most important things in your life: health, family, friends, food and home. Focusing on these things and finding the most pleasure in them. I don’t just eat healthy... I spend time learning about new cuisines and cooking techniques, so I and my family, can enjoy eating healthy food more. I try also to think about what William Morris and the Arts and Crafts Movement promoted so long ago.. craftsmanship. If you can find and afford something that is made... no not just made: crafted by an individual.. this can both food and furniture... buy it. Support a person in living a life in which he gets to put love into objects and food... that he gets to spend his days creating art. I once visited the Shaker Village in Hanover, MA. For Shakers craftsmanship was symbolic of their devotion to God. Everything they made was infused with spirit, they strived for perfection to bring heaven to earth. Craftsmanship is so pronounced in their work that when I walked into my first Shaker house my jaw dropped at the site of the door hinge... yes the door hinge screamed craftsmanship. So did the door knobs and the coat hooks... nothing in this home was built without care... nothing mass produced. The soul of the owner echoed in every room, every corner, on every floor of this HOME. I would love to fill my house with objects that I love and were made with so much love that the imprint of the artist’s soul is engraved in the work and emanates through out my home. http://www.etsy.com/ for furniture and house hold items handmade. I really enjoyed this post, Diane. I totally agree; quality is far more important than quantity (I use this rule with clothes and shoes as well). I also enjoyed the links that you shared. It's interesting to hear other people's thoughts on clutter in our post modern world. Thanks April... I'm not surprised to hear you agree with quality over quantity. I can tell you think about purchases from some of your posts. I buy few things, but when I do I try to buy things that are made well and make me smile. I enjoyed your article! Very funny... but was it a Mason Pearson brush? I've always wondered if they are worth investing in. I love shaker style too. I am actually a Scandinavian, but I don't like super stark, white boxes for houses. I rather like natural materials, crafts, softness. But with an ascetic edge :) And only the necessary. As well as soothing to my spirit, this style is also kid-friendly and easier to maintain (with maintaining my sanity at the same time). I love your taste... clean with a softness... very nice. I have found myself searching for a functional item and deciding that it also needs to be aesthetically pleasing, because I limit my item now. Occasionally this leads to frustration but in the end using the item always makes me smile. You definitely hit on the fact that function and beauty needs to be appreciated. Thanks so much I'm glad I helped summarize this for you. Love this post we can all learn a lot from it, I am now following you!! Laura from Real Momma stopping by to say thanks for linking up to the Best of your Best Blog Hop! Thanks so much for following. If you liked this post you might enjoy some of my others under: Simple Living Ideas. I love the new party I'll see you there each week.